The use of call reporting and analytics services in all the major organizations and companies has been getting commoner with the passage of time. If you happen to be someone who is planning to introduce such a piece of software in your business as well and are wondering how exactly the software would be able to improve your customer support department, then you have landed on the right page. The below-mentioned information is going to help a great deal in this regard. Without further ado, let’s take a closer look to let you make an informed decision. What is a CDR Report? CDR (Call Detail Record) – According to the definition given Wikipedia, in IP Telephony, a call detail record is a data record that contains information related to a telephone call, such as the origination and destination addresses of the call, the time the call started and ended, the duration of the call, the time of day the call was made and any toll charges that were added to the network or charges for operator services, among other details of the call. Cisco CDR Analysis and Reporting? What data? Well, CAR is an application service that runs on the CUCM cluster (the publisher, actually). If activated, this application can consume call detail records (CDR) and call maintenance (or diagnostic) records (CMR). The CDR/CMR data is written into the file on the CUCM publisher. Call detail records (CDR)— Data records that contain information about each call that was processed by CallManager. Call management records (CMR)— Data records that include quality of service (QoS) or diagnostic information about the call. Also referred to as diagnostic records. Both CDRs and CMRs together are referred to as CDR data. CDR data provides a record of all calls that have been made or received by users of the CallManager system. CDR data is useful primarily for generating billing records; but, it can also be used for tracking call activity, diagnosing certain types of problems and capacity planning. CDRs contain information about call origination, call destination, the date and time the call was started, the time it connected, and the time it ended. A call is considered started or originated when the caller goes off-hook. The call is considered ended when either the caller or the called party goes on-hook. CMRs contain information about the amount of data sent and received, jitter, latency, and lost packets. The CDR Repository Manager sends CDR files to up to three preconfigured destinations (billing servers) using FTP/SFTP. It also maintains files on disk to make sure the storage usage does not exceed predefined limits. If you exceed the predefined limits, the CDR Repository Manager deletes old files to reduce the disk usage to the preconfigured low mark. Files get preserved for a certain number of days based on configuration. Files that are old enough to fall outside of the preservation window get automatically deleted. Why Cisco CDR Reporting and Analysis? 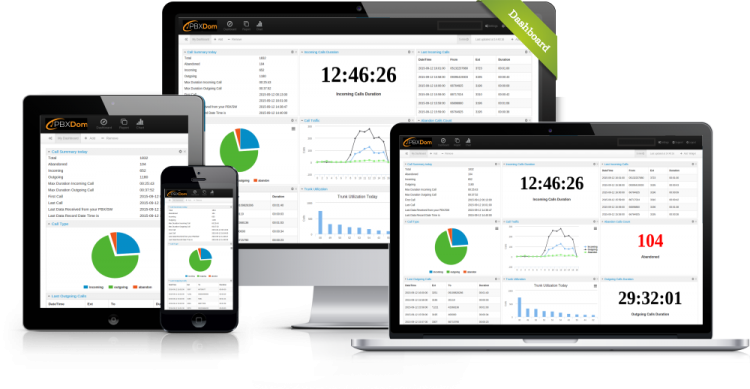 1-You, want Cisco CDR reporting software because you need to Reduce Expenses of telecom. Corporations are always looking for ways to cut costs and maximize profit. Thousands of companies use PBXDom’s many features to help them trim costs and save money! 2-You, want Cisco CDR reporting software because you need to perform Voice Traffic Analysis. Deal with multi­vendor/multi­systems, employee abuse/misuse, and voice usage irregularities, just to name a few.Without a proper way to manage voice communications, expenses can escalate rapidly. the custom reports informing the authorities of any suspicious calling patterns and system inefficiencies. 3-You, want Cisco CDR reporting software because you need Emergency 911 Alerts. Employees can be located anywhere in the world, thus making it difficult to identify the location of an Emergency 911 Caller. PBXDom instantly notifies managers/security when an Emergency 911 call is placed and contains identifiers (name, extension, address, building, floor, room, etc.). This allows emergency crews to locate the caller and dispatch help easily ASAP. 4-You, want Cisco CDR reporting software because you need Call Accounting. A majority of companies charge calls with PBXDom by importing their negotiated long distance rates. Companies can also charge calls by choosing rates from a list of long-distance carriers, use fixed costs per minute, trunk group costing, message unit costing, banded costing, fixed costs per call, on­network /off­network costing and much more. 5-You, want Cisco CDR reporting software because you need Toll Fraud Notification. No matter how secure your voice platform might be, the possibility of toll fraud, abuse, and employee misuse still exists. PBXDom allows users to easily configure an unlimited number of alarms to instantly alert managers of potential toll fraud and internal abuse. 6-You, want Cisco CDR reporting software because you need Employee Productivity. managers can use to ensure their employees are as productive as possible. How to set up Cisco CDR reporting? Are you ready to start monitoring and analysis your Cisco CDR?